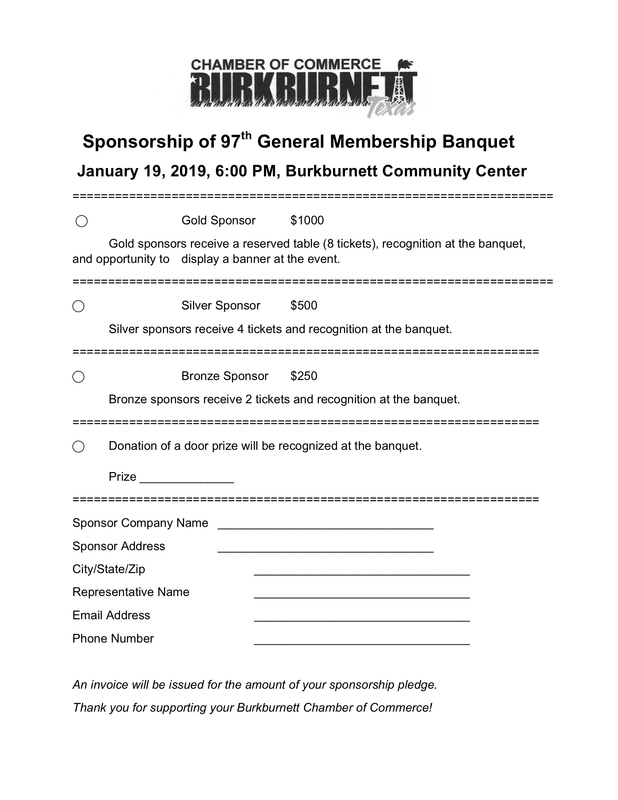 97th Annual Membership Banquet – Saturday, January 19, 2019 — Hold the Date! We hope to see you at the 97th Annual Membership Banquet Saturday, January 19th at 6:00 pm at the Burkburnett Community Center, 735 Davy Dr. Tickets are available for $30 per person. Also be thinking about your ideas for Business of the Year and Citizen of the Year – Nomination forms available by calling the chamber 940-569-3304. Gold Sponsor: $1,000 – includes a reserved table (8 tickets), recognition at the banquet and the opportunity to display a banner at the event. Gold, Silver and Bronze sponsors will also be recognized in the Burkburnett Informer Star. If you want to be a sponsor, let us know what level and we will get you on the list!! Simply contact the Chamber with your contact info, the number of tickets desired. Sponsorship Forms can be emailed to the chamber, mailed or called into the office. We are located at 104 W. 3rd St. or give us a call 940-569-3304.